NK cells play a key role in the control of CMV infection in mice, but the mechanism by which NK cells can recognize and kill CMV-infected cells is unclear. In this study, the modulation of NK cell susceptibility of human CMV (hCMV)-infected cells was examined. We used a human lung and a human foreskin fibroblast cell line infected with clinical isolates (4636, 13B, or 109B) or with laboratory strains (AD169, Towne). The results indicate that all three hCMV clinical isolates confer a strong NK resistance, whereas only marginal or variable effects in the NK recognition were found when the laboratory strains were used. The same results were obtained regardless of the conditions of infection, effector cell activation status, cell culture conditions, and/or donor-target cell combinations. The NK cell inhibition did not correlate with HLA class I expression levels on the surface of the target cell and was independent of the leukocyte Ig-like receptor-1, as evaluated in Ab blocking experiments. No relevant changes were detected in the adhesion molecules ICAM-I and LFA-3 expressed on the cell surface of cells infected with hCMV clinical and laboratory strains. We conclude that hCMV possesses other mechanisms, related neither to target cell expression of HLA-I or adhesion molecules nor to NK cell expression of leukocyte Ig-like receptor-1, that confer resistance to NK cell recognition. Such mechanisms may be lost during in vitro passage of the virus. These results emphasize the differences between clinical hCMV isolates compared with laboratory strains. Human CMV (hCMV)3 is a ubiquitous pathogen that persists in the host in latent form. However, CMV reactivation or primary infection may cause severe disease and even death in the fetus or in immunocompromised individuals, such as in AIDS or transplant recipients. hCMV is also one of the major causes of transplant failure (1). NK cells may play a key role in the control of CMV infection. One patient with a complete and selective NK cell deficiency had unusually severe manifestations of hCMV and other herpesvirus infections (2). The importance of NK cells has also been demonstrated in animal experiments; resistance against murine CMV (mCMV) can be manipulated by NK cell depletion or NK cell reconstitution in infected mice (3, 4). The NK protection against mCMV infection is related to a defined resistance gene locus, Cmv-1, mapping to chromosome 6 in the NK complex region (5, 6). Mice that have the Cmv-1 resistant allele have lower splenic mCMV titers than strains of mice that do not have that allele (7). mCMV infection is controlled by NK cells and Cmv-1 in an organ-dependent manner. The perforin and Cmv-1 genes appear to be required for the NK effector mechanism operating in the spleen, but not in the liver during mCMV infection; NK cell production of IFN-γ instead prevails as a dominating effector function in the liver (8). Despite several lines of evidence demonstrating a protective role for NK cells in CMV infection, the mechanism by which NK cells can recognize virus-infected cells is unclear. The control of NK lysis in general is the result of a fine tuning between positive and negative signals (9). Adhesion molecules and other triggering receptors at both the target and the effector cell level can affect lysis by NK cells, probably by contributing to the delivery of a positive signal. In this context, some reports suggest that hCMV infection can increase the expression of ICAM-1 and LFA-3 on infected cells, leading to an increased susceptibility to NK cell killing (10, 11). On the other hand, engagement of HLA class I (HLA-I) molecules on target cells by specific inhibitory receptors is a well-defined negative signal for NK cells (9, 12). hCMV is able to reduce cell surface expression of HLA-I by a variety of mechanisms mediated by viral gene products, such as US2, US3, US6, and US11 (13). This may lead to a CTL failure of hCMV-infected cell recognition. On the other hand, there is a possibility that this reduced HLA-I expression instead leads to NK cell recognition of hCMV-infected target cells (12, 14). Despite this suggested complementary role between CTL and NK cells in the scrutiny of hCMV-infected cells, it has recently been proposed that hCMV can evade both surveillance mechanisms by a simultaneous use of the US and UL18 genes (14). The UL18 gene product binds β2-microglobulin (β2m) and shares ∼25% of homology in α1, α2, α3 domains with HLA-I molecules (15), and it may present endogenous peptides (16). Recently, the possible role of the MHC class I homologue in NK cell inhibition was investigated both in mice and humans (17, 18, 19). These studies indicate that the CMV MHC class I homologue may be involved in inhibiting NK cell functions. However, another recent report instead suggests an NK-activating role for this molecule and an increased NK cell-mediated killing of fibroblasts infected with a laboratory strain of hCMV (10). Thus, there is no general agreement on the role of this pseudo class I Ag in the regulation of NK cells. Recently, a possible mechanism of action of UL18 has been suggested by Cosman et al. (20), who demonstrated that UL18 is specifically recognized by the leukocyte Ig-like receptor-1 (LIR-1). This is an inhibitory receptor of the Ig superfamily, capable of binding classical and nonclassical HLA class I molecules (for a review see Refs. 21 and 22). It is predominantly expressed on monocytes, B cells, and a minor subset of T and NK cells (23, 24, 25). However, there is still a lack of evidence supporting a role for UL18 in inhibiting NK cell functions. All the above mentioned studies (10, 17) deal with target cells infected with hCMV laboratory strains, such as the widely used AD169. Laboratory strains may however differ from freshly isolated, clinical hCMV strains (26). We therefore investigated the susceptibility to NK killing of target cells infected both with highly passaged hCMV laboratory strains and with clinical isolates that have been propagated in vitro for <20 passages. Our data show that all the three hCMV clinical strains confer a strong NK resistance, whereas the same target cells infected in parallel with laboratory strains yielded only marginal or nonreproducible effects with respect to NK recognition. Moreover, all the clinical strains studied inhibit the NK cytotoxicity in an HLA-I- and LIR-1-independent way. Human foreskin fibroblasts (HFFs, HS27) were obtained from American Type Culture Collection (ATCC, Manassas, VA), and human embryonic lung fibroblasts (HLs) were purchased from the Department of Microbiology, Sahlgrenska Hospital, Gothenburg, Sweden. They were used between passages 21 and 37 and 14 and 19, respectively. All fibroblasts were grown in Dulbecco’s modified medium supplemented with 5% FCS, 2 mM l-glutamine, 100 U/ml penicillin, 100 μg/ml streptomycin, and 0.01% Fungizone (Life Technologies, Stockholm, Sweden). The NK leukemia cell line NKL was obtained from Dr. M. J. Robertson (Bone Marrow Transplantation Program, Indiana University, Indianapolis, IN), and it was grown in RPMI supplemented with 10% FCS and 180 IU/ml IL-2. The T2 cell line (27) and the HLA-I-deficient EBV-transformed B lymphoblastoid cell line 721.221 were maintained in RPMI 1640 supplemented with 10% FCS, 2 mM l-glutamine, 100 U/ml penicillin, 100 μg/ml streptomycin, nonessential amino acids, and 1 mM sodium pyruvate. To generate the 721.221-transfectant cell line DT361, a chimeric cDNA containing the leader segment of HLA-B*5801 and the extracellular, transmembrane, and cytoplasmic domains of HLA-G1 was generated by PCR using the following oligonucleotide primers: sense primer 1: 5′-GCGCTCGAGATGCGGGTCACGGCG CCCCGA-3′; antisense primer 1: 5′-CATGGAGTGGGAGCCGGCCCAGGTCTCGGT-3′; sense primer 2: 5′-GGCTCCCACTCCATGAGGTAT-3′; and antisense primer 2: 5′-GCGCAAGCTTTCAATCTGAGTTCTTC-3′. PCR was performed using a wild-type HLA-B*5801 cDNA as a template with primer set 1 and using wild-type HLA-G1 cDNA as a template with primer set 2. Products from these PCR reactions were mixed and used as templates for a subsequent reaction with sense primer 1 and antisense primer 2. The product was digested with XhoI and HindIII and ligated into the pBJneo vector. 721.221 cells were transfected with the chimeric cDNA and selected in 1 mg/ml G418, and transfected cells expressing high levels of HLA-I were sorted by flow cytometry. PBMC were isolated by centrifugation on Lymphoprep gradients (Nycomed Pharma, Oslo, Norway) from buffy coats of normal donors obtained from the Blood Bank of the Karolinska Hospital (Stockholm, Sweden). After isolation, the PBMC were washed and incubated in serum-free medium in horizontally placed flasks for 1 h at 37°C to remove adherent cells. Nonadherent cells were then collected, washed, and resuspended in RPMI 1640 medium supplemented with 10% FCS, 2 mM l-glutamine, 100 U/ml penicillin, 100 μg/ml streptomycin, nonessential amino acids, and 1 mM sodium pyruvate. For the generation of IL-2-activated killer cells (LAK), 1 × 106/ml nonadherent cells were cultured in the presence of 1000 U/ml IL-2 for 2–4 days and then used in cytotoxicity assays. Polyclonal NK cell cultures were obtained by coculturing nonadherent cells (4 × 105 cells/ml) with irradiated (3000 rad) RPMI 8866 (105 cells/ml) for 10 days as previously described (28). On day 10, the cell population contained 80–90% CD56+CD3− cells as assessed by FACS analysis. For the generation of NK cell clones, polyclonal NK cell populations were depleted of CD3+ cells by magnetic beads (Dynal, Oslo, Norway) coated with anti-CD3 mAb. More than 95% of the remaining cells were CD56+ CD3− as assessed by FACS analysis. Clones were generated by limiting dilution of the CD3-depleted cells in 96-well plates in the presence of irradiated (3000 rad) allogeneic PBMC and RPMI 8866, supplemented with 0.5 μg/ml PHA and 1000 U/ml IL-2. All cell lines were grown at 37°C in 7.5% CO2 in air. The following strains of hCMV were used: the laboratory strains AD169 (continuously passaged from 1988) and Towne, obtained from V. A. Sundqvist (Karolinska Institute) and ATCC (VR-977) respectively; the clinical isolates 4636 (passages 12 or 18, from a bone-marrow transplanted child), 109B (passage 14 or 20, from a kidney transplant recipient), and 13B (passage 14 or 20, from an AIDS patient). All strains had been propagated on HLs. Virus stocks were harvested from the supernatants of hCMV-infected HLs at 10–14 days postinfection and stored at −70°C. Virus stocks were titrated using a plaque assay and used at a multiplicity of infection (MOI) of 1 or 2. Virus stocks were confirmed to be Mycoplasma free (Mycoplasma T.C. II Rapid Detection System, Gen-Probe, DPC, Skafte, Sweden). Cells were either treated with medium alone or infected with hCMV at a MOI of 1 or 2. After adsorption of the virus for 1 h at 37°C, the inoculum was removed, and medium containing 5% FCS was added. In all experiments, performed at day 8 (with a MOI of 1) or at day 4 (with a MOI of 2), a 95–100% cytopathogenic effect was obtained, as determined by microscope analysis. Cell-mediated cytotoxicity was assessed in 4-h 51Cr release assays. In these assays, different concentrations of effector cells were incubated with 5 × 103 target cells in V-bottom, 96-well microtiter plates at 37°C in 7.5% CO2 in air. In the blocking experiments, cells were incubated with saturating amounts of specific or isotype control Abs for 15 min at room temperature. Cells were then washed once and used in the assays. Percentage of lysis was determined by counting a 100-μl aliquot of supernatant and using the formula: % specific lysis = 100 × [(sample release − spontaneous release)/(total release − spontaneous release)]. PE-labeled mAb anti-CD56 was purchased from Becton Dickinson (San Jose, CA). Anti-ICAM-1 (clone LB2) was kindly provided by Dr. Manuel Patarroyo (Microbiology and Tumor Biology Center, Karolinska Institute). Cychrome-labeled anti-CD3 (clone UCHT1) was obtained from PharMingen (San Diego, CA). Anti-LFA-3 Ab (clone BRIC-5) was purchased from Serotec (Oxford, England). FITC-conjugated rabbit anti-human β2m Ab and purified mouse IgM were purchased from Dako (Glostrup, Denmark). Control IgG conjugated with different fluorochromes were obtained from Caltag (Burlingame, CA). Anti-HLA-I supernatant from the hybridoma A6-136 (IgM isotype) was kindly provided by Dr. Lorenzo Moretta (Centro Biotecnologie Avanzate, Genoa, Italy). Purified anti-CD56 Ab (clone C218, IgG1 isotype) was obtained from Immunotech (Marseille, France). Purified anti-LIR-1 Ab (clone M405, IgG1 isotype) was kindly provided by Dr. D. Cosman (Immunex, Seattle, WA) and has been previously described (29). Cells were labeled and analyzed on a FACscan flow cytometer (Becton Dickinson). Statistical analysis of the data was performed using a paired Student t test. A value of p < 0.05 was considered statistically significant. To assess whether hCMV infection affects NK recognition, HFFs were infected with the clinical strain 4636 (derived from a bone marrow transplant recipient) and tested for sensitivity to NK cell-mediated cytotoxicity 8 days later. 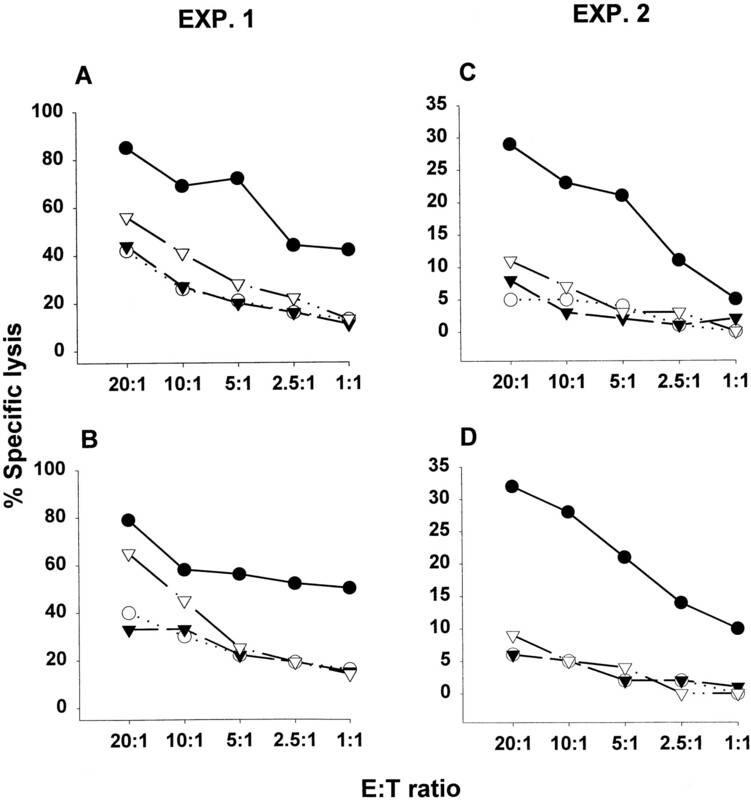 The sensitivity of 4636-infected HFFs to a polyclonal NK cell population (see Materials and Methods) was much lower than that of uninfected HFFs (Fig. 1⇓A). The same result was obtained with 12 of 12 donors tested (Fig. 2⇓ and data not shown), thus excluding the possibility that this recognition pattern was limited to a single donor-target cell combination. To exclude also the possibility that this reactivity was due to the particular effector cell type, we generated short term LAK cells from the same donor as in Fig. 1⇓A, and NK clones from a different donor. Also these types of effector cells showed reduced killing of 4636-infected HFFs (Fig. 1⇓B and data not shown). The reduction in the killing was considerable, ranging between 48 and 92% at an E:T ratio of 12.5:1. HFFs infected with the clinical isolate 4636 of hCMV are protected from NK cell-mediated killing compared with uninfected cells. HFFs were left uninfected (•) or were infected with the clinical isolate 4636 of hCMV (○) at a MOI of 1. The susceptibility of these cells to NK cell-mediated lysis was then measured on day 8 postinfection in a 4-h 51Cr release assay. A, A polyclonal NK cell culture was used as effector cells. B, LAK cells from the same donor were used as effectors. Resistance to NK cell-mediated lysis of HFFs infected with 4636, 13B, and 109B clinical isolates of hCMV. HFFs were left uninfected (•) or were infected with the clinical isolate 4636 (○), 13B (▾) or 109B (▿). HFFs were infected at a MOI of 1 and used 8 days after infection in a 4-h 51Cr release assay. Two independent experiments are shown, in which NK cells derived from donor 41 (A and C) or donor 42 were used (B and D). To investigate whether the decrease of NK susceptibility was exclusive for 4636, two other hCMV clinical isolates, 13B from an AIDS patient and 109B from a kidney transplant recipient, were analyzed. These viral isolates gave essentially the same picture, rendering target cells less susceptible to NK recognition than the noninfected fibroblasts (Fig. 2⇑). 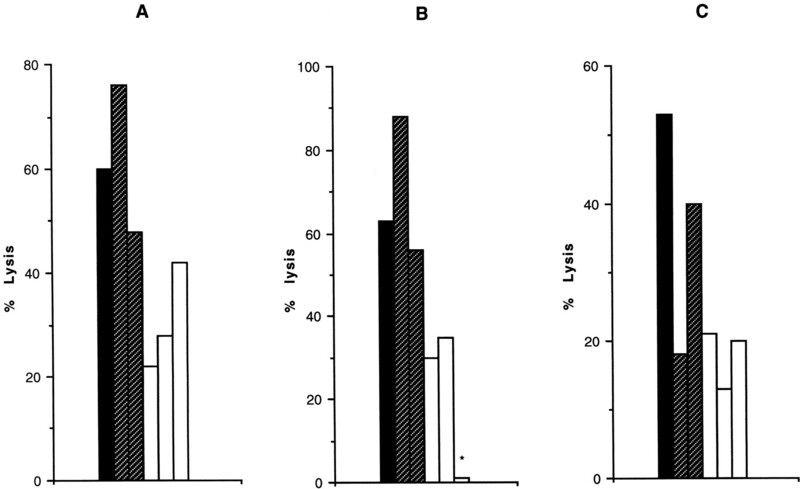 The differences in lysis that sometimes could be observed between HFFs infected with different viral isolates were not due to different levels of infection, because a similar infection efficiency (95–100%) was obtained with all strains (data not shown). 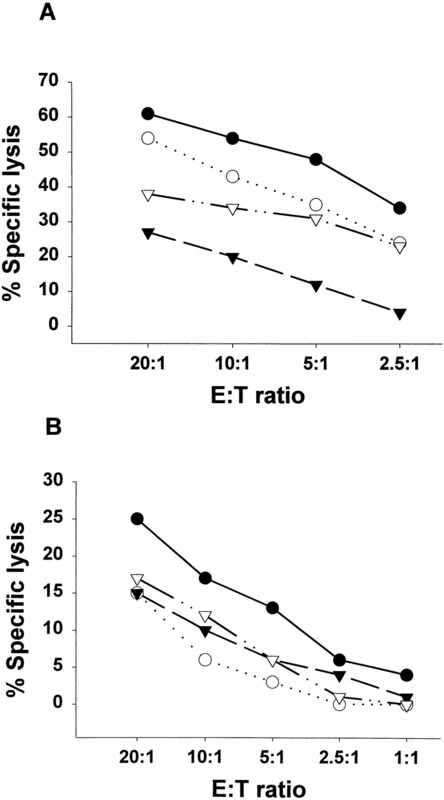 Inhibition of the killing ranged between 43 and 87% for 13B and between 15 and 82% for 109B, at an E:T ratio of 10:1. To verify whether the clinical hCMV strains can confer protection from lysis by NK cells to fibroblasts other than HFFs, we used the HL cell line, originated from human embryonic lung fibroblasts. Similar results were found with polyclonal and LAK cells (Fig. 3⇓), as well as NK clones (data not shown) as effectors, as we could always observe a reduction in the lysis of infected HLs. The inhibition ranged between 20 and 72% for 4636, between 44 and 87% for 13B, and between 30 and 78% for 109B, at an E:T ratio of 10:1. Resistance to NK cell-mediated lysis of HLs infected with 4636, 13B, and 109B clinical isolates of hCMV. HLs were left uninfected (•) or were infected with the clinical isolate 4636 (○), 13B (▾) or 109B (▿). HLs were infected at a MOI of 1 and used 8 days after infection in a 4-h 51Cr release assay. A, Polyclonal NK cell culture used as effector. B, LAK cells as effectors. These results are representative of one of five independent experiments. Taken together, these results indicate that both HFFs and HLs infected with hCMV clinical isolates are less susceptible to NK cell-mediated killing than the original noninfected fibroblasts. This pattern was seen regardless of effector cell activation status, cell culture conditions, and/or donor-target cell combinations. It has recently been shown that infection of fibroblasts with the laboratory strain AD169 increases the susceptibility to NK cell-mediated killing (10, 11). To compare NK cell-mediated cytotoxicity of fibroblasts infected with clinical isolates vs fibroblasts infected with the laboratory strains Towne or AD169 of hCMV, we performed cytotoxicity assays using HFFs or HLs target cells and polyclonal NK cultures as effector cells (Fig. 4⇓). Whereas fibroblasts infected with the clinical strains always showed a consistent reduction in the susceptibility to killing, AD169-infection resulted in a variable pattern of reactivity. In some experiments, AD169 infection increased the susceptibility to NK killing (Fig. 4⇓, A and B). However, in our experimental conditions, this pattern was not always observed; in some experiments there was a decrease in the killing of AD169-infected cells (Fig. 4⇓C). HLs and HFFs infected with the Towne strain were on the average less susceptible to lysis compared with the uninfected counterpart. However, the reduced recognition conferred by Towne infection was weaker than that detected with clinical strain-infected fibroblasts (ranging between 11 and 25%), and in some experiments no protection was detectable. Comparison of NK cell susceptibility of fibroblasts infected with different hCMV strains (MOI 1). HFFs or HLs were left uninfected or were infected with different hCMV strains at a MOI of 1 and used after 8 days in 4-h 51Cr release assays. From left to right of each histogram: uninfected cells (▪); AD169 and Towne (▨); 4636, 13B, and 109B (□). 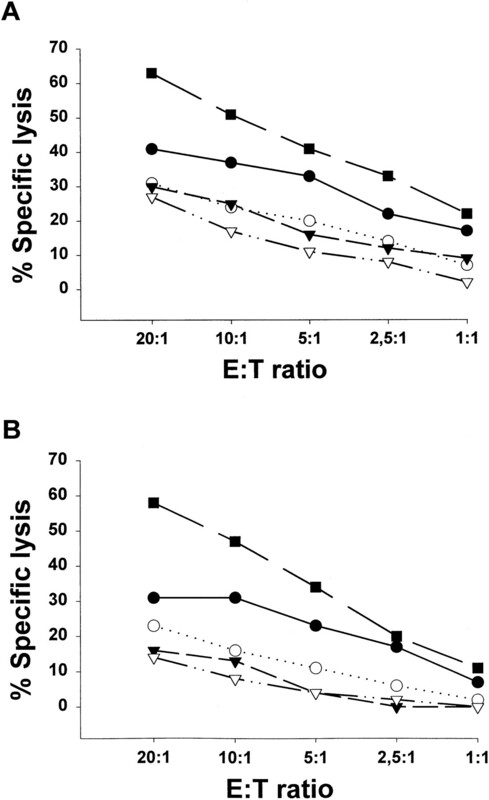 Lysis at an E:T ratio of 20:1 from three independent experiments is shown. ∗, Not tested. A and B, HFFs as target cells; C, HLs as target cells. To exclude the possibility that our results were confined to one particular condition of infection (with MOI 1 and cytotoxicity assay after 8 days), we also performed experiments where HFFs were infected at a MOI of 2 and used as targets at 4 days postinfection (Fig. 5⇓). Also in this experimental condition, the clinical isolates were able to inhibit NK cell-mediated killing, and infection with AD169 still resulted in a variable pattern of NK recognition, being able to increase (Fig. 5⇓) or decrease (data not shown) the susceptibility to NK killing. Comparison of NK cell susceptibility of fibroblasts infected with different hCMV strains (MOI 2). HFFs were left uninfected (•) or were infected with AD169 (▪) or with the clinical isolate 4636 (○), 13B (▾), or 109B (▿). HFFs were infected at a MOI of 2 and used 4 days after infection in a 4-h 51Cr release assay. Polyclonal NK cell cultures from two different donors (A and B) were used as effectors. These results are representative of one of three independent experiments. We conclude that clinical and laboratory strains of hCMV differ in their capacity to induce NK sensitivity. The clinical strains always confer a high degree of protection, whereas the highly passaged laboratory strains cause a slight increase or marginal protection only. This pattern was observed regardless of the experimental conditions used. It has been proposed that the susceptibility of hCMV-infected cells to NK lysis correlates with changes in cell surface expression of the adhesion molecules LFA-3 and ICAM-1 (10, 11). We therefore investigated whether the differences observed between cells infected with hCMV clinical or laboratory strains could be due to a virally induced modulation of the expression of these adhesion molecules. HFFs were infected with different strains of hCMV at a MOI 2 (Fig. 6⇓) or MOI 1 (data not shown) and stained for ICAM-1 and LFA-3 expression at 4 and 8 days postinfection, respectively. 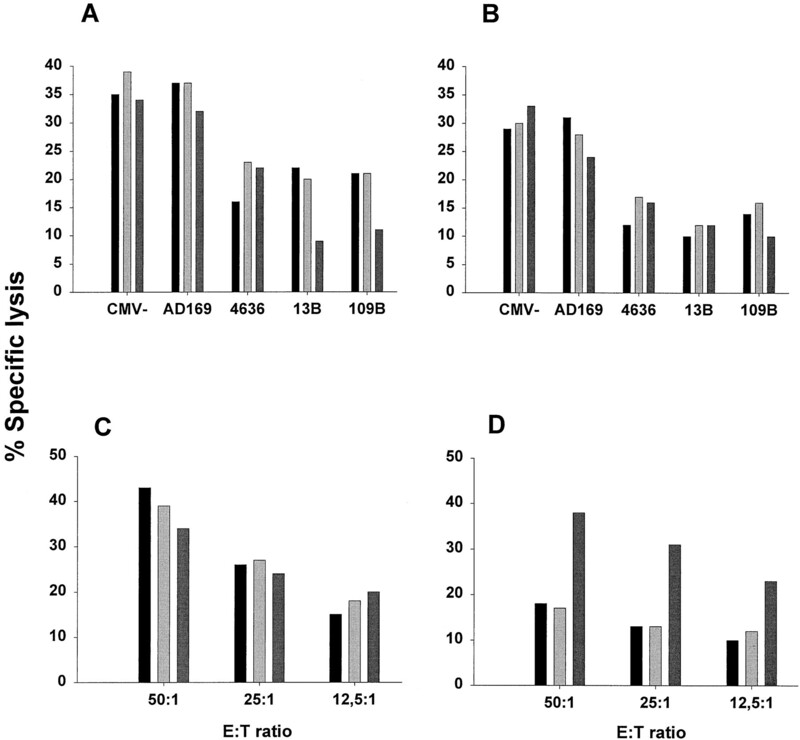 As previously reported for AD169 (10, 11) and for other clinical isolates not included in this study (11), there was an increased expression of ICAM-1 upon CMV infection, with a similar pattern observed for all the virus strains tested (Fig. 6⇓A). In contrast, infection of fibroblasts either with AD169 or with clinical strains did not affect LFA-3 expression (Fig. 6⇓B). The same pattern was observed when the cells were infected with a MOI of 1 and stained 8 days later (data not shown). In Fig. 6⇓C, the T2 cell line was used as a positive control for LFA-3 and ICAM-1 staining. Effect of infection of HFFs with different strains of hCMV on the cell surface expression of adhesion molecules. HFFs were left uninfected or were infected with different hCMV strains at a MOI of 2. Expression of ICAM-1 (A) and LFA-3 (B) was measured by flow cytometry on day 4 postinfection. Control Ig (cIg) on uninfected cells (thin solid line). C, ICAM-1 and LFA-3 staining on T2 cells as positive control. FL1-H, FiTC fluorescence. MHC-I is one of the major regulatory elements for NK recognition, being able to inhibit NK cell functions after binding to specific inhibitory receptors (9, 12). The expression of cell surface HLA-I molecules on fibroblasts infected with different hCMV strains at a MOI of 1 was therefore compared using FACS staining with an anti-β2m mAb on day 8 postinfection (Figs. 7⇓ and 8). There was a low basal level of HLA-I expression on uninfected cells. A down-modulation of HLA-I on HFFs infected either with clinical isolates or with laboratory strains was observed (Fig. 8⇓). Down-modulation of HLA-I molecules in AD169- and Towne-infected cells was statistically significant, although this was not the case with clinical strain-infected cells. Comparable results were obtained with HLs (data not shown). Down-modulation of HLA-I molecules on HFFs infected with the hCMV laboratory strain AD169. HFFs were left uninfected (thick solid line) or were infected with AD169 (thin solid line) at a MOI of 1. Eight days after infection, cells were stained with FITC-conjugated anti-β2m mAb. Control (cIg) on uninfected (dashed line) and infected cells (dotted line). FL1-H, FiTC fluorescence. Levels of cell surface expression of HLA-I molecules after infection of HFFs with different strains of hCMV. 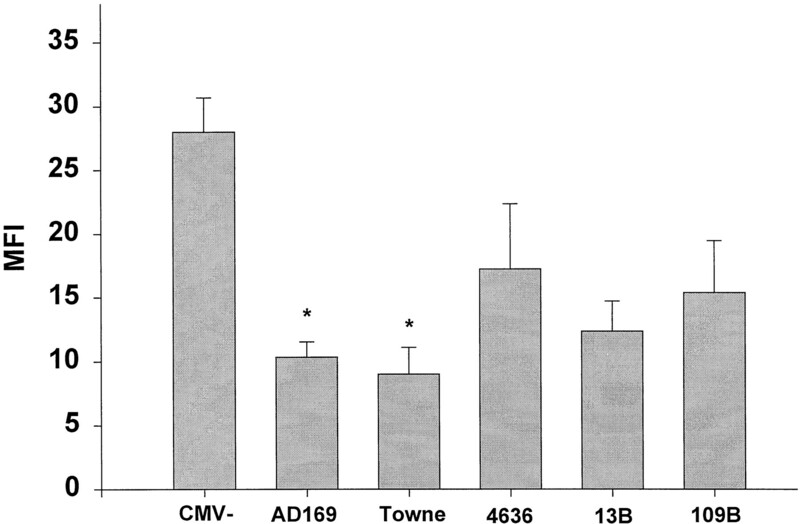 Fibroblasts were left uninfected (CMV−) or were infected with hCMV strains AD169, Towne, 4636, 13B, or 109B at a MOI of 1. Eight days after infection, cells were stained with FITC-conjugated anti-β2m mAb. Values of the median of fluorescence intensity (MFI) are reported in the y-axis. Values are means and SE of three independent experiments in each group. ∗, p < 0.05 compared with uninfected cells by paired Student t test. Taken together, these results argued against a direct correlation between cell surface expression of HLA-I and protection from NK cell killing, because this would have predicted an increased HLA-I expression on fibroblasts infected with clinical isolates compared with noninfected cells. To further investigate the role of HLA-I expression on target cells, we performed cytotoxicity experiments in which uninfected or infected fibroblasts were preincubated with an anti-HLA class I mAb. The expectation from this kind of experiment was that if NK cells were restrained from killing fibroblasts infected with clinical strains by a HLA-I-dependent mechanism, blocking this interaction should reverse the protection. Despite the maintained capability of the Ab to bind to class I molecules expressed on the surface of infected cells (data not shown), blocking HLA-I on infected fibroblasts did not reverse the inhibition of the killing (Fig. 9⇓), thus arguing against a role for HLA-I molecules in the decreased susceptibility to killing. On uninfected cells, an increase in the cytotoxicity was observed (Fig. 9⇓), suggesting that on these cells HLA-I partially inhibited NK cell-mediated killing. Similar results were obtained with HLs (data not shown). Blocking HLA-I does not induce NK cell killing on hCMV-infected fibroblasts. HFFs were left uninfected (CMV−) or were infected with hCMV strains AD169, Towne, 4636, 13B, or 109B at a MOI of 1 and used 8 days after infection. 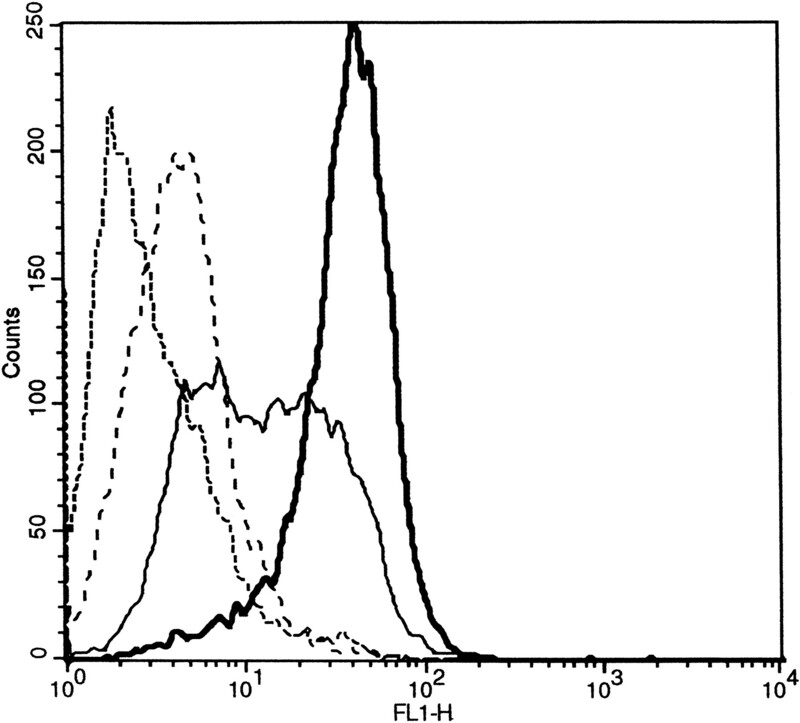 Target cells were preincubated with no Ab (black bars), control IgM (light gray bars) (2 μg/ml) or anti-HLA-I A6–136 mAb (dark gray bars) (100 μl) and then used in a 4-h 51Cr release assay. Lysis at an E:T ratio of 20:1 is shown. These results are representative of one of two independent experiments, each performed with NK cells derived from two different donors. Cosman et al. (20) have described that a soluble form of UL18 is able to bind to LIR-1, an inhibitory receptor belonging to the Ig-like superfamily. Therefore, one possible mechanism was that UL18 could protect cells infected with clinical strains from NK lysis through the engagement and triggering of the inhibitory function of LIR-1. To address this issue, NK cells were preincubated with saturating concentrations of anti-LIR 1 (M405) or anti-CD56 (C218) mAb and then used as effectors against HFFs infected with different hCMV strains (Fig. 10⇓). The susceptibility to NK lysis was not affected by the anti-LIR-1 treatment. In particular, the inhibition of the killing observed with cells infected with clinical isolates could not be reverted by blocking the LIR-1 receptor on the effectors (Fig. 10⇓, A and B). No substantial changes were observed with the control anti-CD56 mAb. In these experiments, 10% (Fig. 10⇓A) and 15% (Fig. 10⇓B) of the effector cells expressed LIR-1 (data not shown). Blocking LIR-1 does not induce NK cell killing on hCMV-infected fibroblasts. 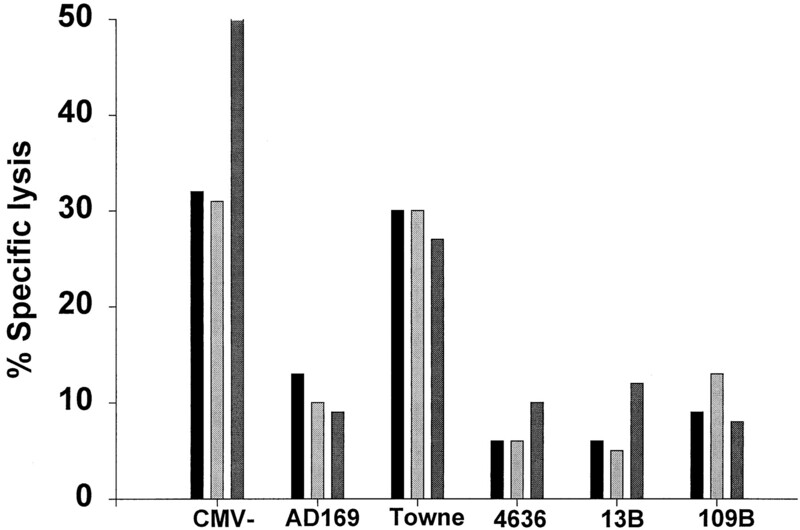 A, B, HFFs were left uninfected (CMV−) or were infected with hCMV strains AD169, 4636, 13B, or 109B at a MOI of 1 and used 8 days after infection. Effector cells were preincubated with no Ab (black bars), anti-CD56 as control (light gray bars) (25 μg/ml), or anti-LIR-1 mAb (dark gray bars) (25 μg/ml) and then used in a 4-h 51Cr release assay. Lysis at an E:T ratio of 25:1 is shown. C, D, The ability of LIR-1 mAb to restore NK lysis was tested against a 721.221 target cell line untransfected (C) or transfected with HLA-G1 (DT361 cell line) (D). 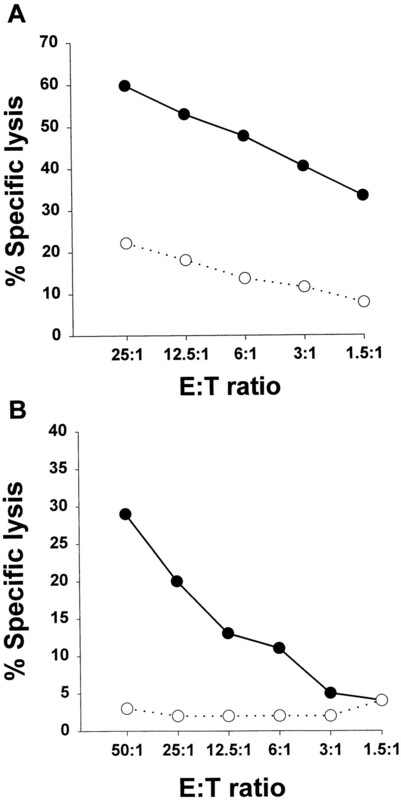 NKL cell line was used as effector at the indicated E:T ratios. These results are representative of one of three independent experiments. As a positive control for function and blockade of the LIR-1 receptor, we tested the LIR-1+ NK leukemia cell line NKL (30) against the HLA-I-deficient cell line 721.221 and the transfectant DT361, expressing only HLA-G1 on the cell surface (Fig. 10⇑, C and D). As previously shown (30), NKL cells were able to kill 721.221 target cells (Fig. 10⇑C), whereas they were unable to kill the HLA-G1 expressing transfectant (Fig. 10⇑D). Pretreatment of NKL with the anti-LIR1 Ab reconstituted the capability to kill DT361 at levels comparable to untransfected cells, suggesting that LIR-1 was involved in the recognition of HLA-G1 and that M405 Ab was able to interfere with LIR-1 function. No effect was seen with the anti-CD56 control Ab. These results indicate that the inhibition of NK lysis observed with fibroblasts infected with the clinical isolates is not dependent on LIR-1. In the present study, we have examined the modulation to NK cell susceptibility of hCMV-infected cells. Human fibroblast target cells of two different origins infected with the hCMV clinical isolate 4636 were resistant to NK cytotoxicity ( Figs. 1–3⇑⇑⇑). The inhibition ranged between 50 and 90%. Similar findings were obtained with fibroblasts infected with two other clinical isolates, but not when they were infected with laboratory strains AD169 and Towne ( Figs. 2–5⇑⇑⇑⇑). Thus, the capability to prevent NK recognition of HFF- and HL-infected cells may be a general feature of hCMV clinical strains. The level of infection of target cells ranged between 95 and 100%, thus excluding any possible influence of uninfected cells, and further supporting the idea that the hCMV infection itself provided the protection from lysis. The inhibition of NK cell killing by hCMV clinical strains could be observed with different NK cell preparations (i.e., polyclonal cultures, LAK cells, and NK clones) and with two different conditions of infection (MOI 1 and MOI 2). Whereas the clinical strains reproducibly inhibited NK recognition, only a marginal effect was detected on target cells infected with the Towne laboratory strain. Infection with the viral strain AD169 resulted either in an inhibition or in an increase of NK susceptibility, and in some experiments no substantial changes were found. Contradictory data have previously been reported by other authors concerning the effect of AD169 infection on NK sensitivity (10, 11, 31, 32). Thus, clinical vs laboratory strains of hCMV differed greatly in their capability to affect NK susceptibility of infected cells. The reason for this difference is at present unknown; genetic differences between the viral strains is one obvious possibility, and a recent report indicates a large DNA sequence difference between clinical isolates and laboratory strains of hCMV (26). The data revealed large scale deletions up to 15 kbp of DNA in laboratory strains that have been extensively passaged in cell culture (i.e., AD169 and Towne). These deletions were not found in low passaged strains, such as Toledo and the clinical strains tested in the study (26). Although at present the functions of the putative proteins encoded in this region are mostly unknown, they may play an important role for the replication, latency, or pathobiology of the virus in the human host. In fact, Penfold et al. (33) have recently shown that one of the genes deleted in laboratory strains encodes for a chemokine. Clinical trials based on immunization of healthy volunteers with AD169, Towne, or Toledo strains indicate that the low passaged Toledo strain exhibits a significantly higher virulence, being able to cause clinically apparent disease (34), compared with other two highly passaged strains (35, 36, 37, 38). It is thus possible that gene products involved in the immunoescape and survival of the virus in the host are deleted in the laboratory strains (33). In the in vitro conditions, there may be no need to escape from the immune system of the host; it is therefore likely that a high number of passages in vitro can lead to the loss of genes that are not essential for hCMV growth and survival in cultured cells. In an attempt to analyze the possible molecular mechanisms used by the clinical strains to prevent NK killing, we analyzed the modulation of the expression of HLA-I molecules after hCMV infection. We observed a statistically significant down-regulation of HLA-I levels only after infection with AD169 or Towne laboratory strains compared with noninfected fibroblasts. Infection with clinical strains also resulted in HLA-I down-modulation, but always at a lower degree compared with the effect observed with the laboratory strains. These data argued against a major role of HLA-I molecules in relation to the difference in NK sensitivity between infected and noninfected fibroblasts. However, it was still possible that HLA-I played an important role in the difference between cells infected with different viral strains. There were at least two different possibilities: 1) the inhibition of the killing could be the result of a cooperation between the effect of HLA-I and a viral factor; 2) HLA-I could play no role at all, and the inhibition would be due to the viral factor alone. Masking HLA-I molecules on the surface of target cells with a specific mAb in the cytotoxicity assays should reconstitute NK recognition if the first hypothesis was correct. The blocking experiments showed no reconstitution of cytotoxicity (Fig. 9⇑ and data not shown). Thus, although fibroblasts infected with clinical strains have higher levels of HLA-I molecules than fibroblasts infected with laboratory strains, HLA-I molecules do not appear to play a role in the induction of the NK-resistant phenotype. Our data are in agreement with previous reports where no correlation was found between cell surface HLA-I expression and NK capability to sense hCMV-infected cells (10, 11, 31). While our study was in progress, a report by Fletcher et al. (11) proposed that an increasing NK cytotoxicity against hCMV infected targets can be due to an increase of the adhesion molecules LFA-3 or ICAM-1. Although, as previously reported, we could observe an increase in ICAM-1 expression on the surface of the cells infected with different hCMV strains (10, 11), we were unable to detect any correlation between LFA-3 expression and susceptibility to NK lysis in both experimental conditions (Fig. 6⇑ and data not shown). Another possible mechanism involved in the protection of cells infected with the clinical isolates could be mediated by the binding of UL18 to LIR-1-expressing NK cells. LIR-1 is an inhibitory receptor structurally related to killer inhibitory receptors, having four extracellular Ig-like domains and delivering an inhibitory signal after engagement with the ligand (for a review, see Refs. 21 and 22). It is expressed on B cells, on monocytes, and on a subpopulation of T and NK cells, and it has a broad specificity, being able to recognize classical and nonclassical HLA class I molecules, as well as the viral-encoded MHC-I molecule UL18 (20, 23, 24, 25, 30, 39). Thus, in our system, one possibility was that UL18, expressed on the cell surface of infected cells, was able to engage LIR-1 on NK cells, thus inhibiting NK lysis. The blocking experiments argue against this possibility, as we could not restore the killing by blocking the LIR-1 receptor on NK cells (Fig. 10⇑, A and B). The range of LIR-1 expression in the polyclonal NK cultures used in these experiments was 10–15% (data not shown). We cannot exclude the possibility that the use of effector cells with a higher and homogeneous LIR-1 expression could lead to different conclusions. On the other hand, our blocking experiments clearly suggest that the inhibition is detectable even in the presence of a low percentage of LIR-1 expressing effector cells, and it is not affected by anti-LIR-1 mAb. If we can exclude a role for HLA-I, for adhesion molecules (at least ICAM-1 and LFA-3) and for LIR-1, which is then a possible molecular mechanism involved in the protection of cells infected with the clinical strains? There are at least two different possibilities. First, the inhibition could be mediated by a soluble host cell factor released from infected cells during the cytotoxicity assay, able to act either at the target or at the effector cell level. In this context, IFN-β, TGF-β, or soluble HLA-I could play a role in the inhibition of the killing (31, 40, 41, 42). The second possibility still lies at the level of interaction between molecules on effector and target cells. In this context, hCMV clinical strains may induce on the cell surface of infected cells the expression of different types or levels of UL18 or of other molecules involved in the NK recognition. The majority of the data available in the literature concerning hCMV interactions with NK cells were generated with laboratory strains. Our data suggest that caution should be applied in the interpretation of these data, and this is further emphasized by reports showing that large genomic variations can exist between laboratory and clinical isolates (26). Our hCMV clinical strains were generated from either transplant recipients during graft rejection or HIV patients. We speculate that during these conditions the restoration of efficient NK activities would contribute to control the overwhelming hCMV infection, as suggested also by observations in mice infected with mCMV (3). We thank Drs. W. L. Drew and R. C. Miner for providing isolate 13B and Dr. I. Hökeberg for providing isolate 109B. We are also grateful to DNAX (Palo Alto, CA) and Dr. David Cosman for providing reagents. ↵1 This work was supported by grants from the Swedish Cancer Society, the Tobias Foundation, the Swedish Medical Research Foundation, Astra AB, and the Karolinska Institutet. C.C. was supported by a fellowship from the Italian National Research Council and then by Karolinska Institutet. E.C. was supported by European Union Grant ERBFMBICT 972110 and by Associazione Italiana per la Ricerca sul Cancro. ↵3 Abbreviations used in this paper: hCMV, human CMV; mCMV, murine CMV; HLA-I, HLA class I; HFFs, human foreskin fibroblasts; HLs, human lung fibroblasts; MOI, multiplicity of infection; LAK, IL-2-activated killer cells; β2m, β2-microglobulin; LIR-1, leukocyte Ig-like receptor-1. Mocarski, E. S., Jr. 1996. Cytomegaloviruses and their replication. B. N. Fields, Jr, and D. M. Knipe, Jr, and P. M. Howley, Jr, and R. M. Chanock, Jr, and J. L. Melnick, Jr, and T. P. Monath, Jr, and B. Roizman, Jr, and S. E. Straus, Jr, eds. In Virology Vol. 2: 2447 Lippincott Raven, Philadelphia. Borges, L., M. L. Hsu, N. Fanger, M. Kubin, and D. Cosman, D. 1997. A family of human lymphoid and myeloid Ig-like receptors, some of which bind to MHC class I molecules. J. Immunol. 159:5192.